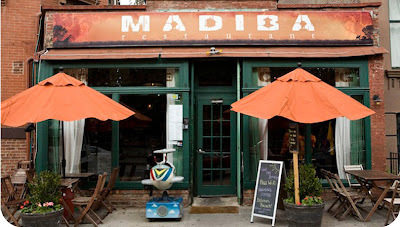 Last night Kurt and I tried out Madiba, a South African restaurant in my neighborhood. I'm absolutely in love with all these online coupon sites out now (like Groupon and Scoutmob) which scored us 50% off our meal. It helps ease my guilt about spending money and encourages us to try new places we might not normally visit. In other news, I am totally fed up with my camera. Every single image I take is grainy, even ones in bright sunlight. I think it's time for an upgrade. I haven't even begun to look at new cameras or consider what I want, but I know my #1 priority is getting crisp images in low light. Any suggestions, photo savvy readers? 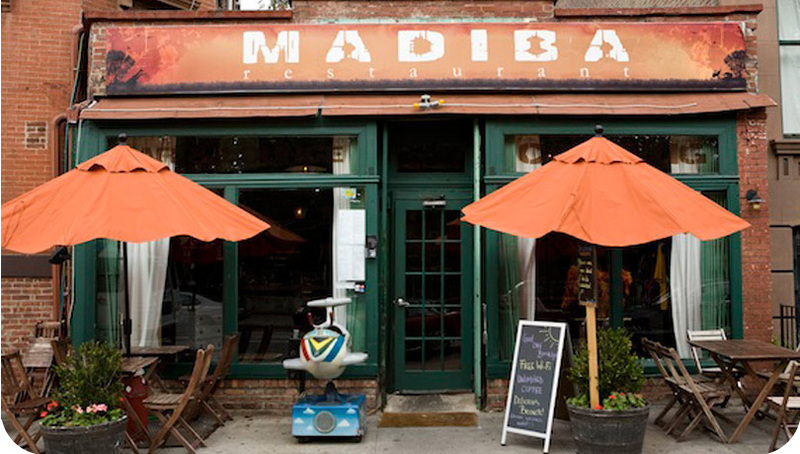 Dinner at Madiba was really tasty! As per usual, Kurt and I split an entrée and added a couple sides. The menu was filled with authentic South African dishes which is definitely a new horizon for me. We decided to try the Bobotie which reminded me of a gourmet meatloaf. It was served with rice and a sampling of sauces. We paired it with some delicious grilled/roasted vegetables and flatbread which we topped with chutney. Everything was so flavorful with spices (but not necessarily spicy which was nice). It reminded me a lot of Indian food and curry flavors. I wish I could have gotten some images of the decor (but of course it was dark and my camera is crap). There are animal skins on the walls and rich, saturated colors everywhere with quirky light fixtures and furniture sprinkled in. The vibe is rugged and cozy. Even after we finished eating, Kurt and I shared another beer and just hung out at talked. It was really nice. It is typically really busy on the weekends, so our Thursday night outing worked out well. I definitely suggest checking it out! Ugh. More of the Same.